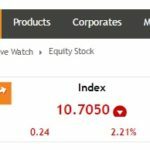 In this post you will learn 10 rules of successful trading. Problems start from misconception of share market. It all starts with “Share Market is Gold – I will invest and become very rich very soon and leave my job”. Well dreaming is ok but over-dreaming is not. 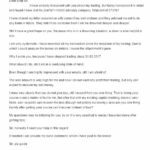 Its not the fault of a new investor or trader – the way things are marketed – its their fault – the media and people who get benefit from your trading like tip providers, trading software providers, high cost brokering firms etc. And yes some fault lies with people I mean you too – most of them even today believe that traders who have done technical analysis are laughing to the banks every day. They also believe that there is some magic where they can make 50k every month from 50k. This is simply not possible. But to make 50k a month they start losing 50k a month but still do not understand unless a big damage is done. 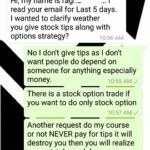 I was having a chat with a trader who said that 3% a month is very less – technical analyst make 2000 everyday with 50,000. My next question was – please name that person I will pay him 25k to learn what he does. 2k everyday with 50k is 44k a month (22 trading days a month) – this is a return of 88% a month. 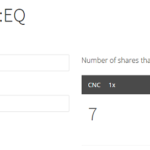 88*12 = 1056% return a year… does it make sense? If you have something in mind – all you have to do is take out a calculator and see if what you have heard makes sense. If not – do not believe in any theory that does not support what you are not seeing on Earth. The above you are seeing is real trade results but exceptional. He is still doing very well but I am yet to find another Ravi. Yes some of my clients are doing very well but they are still not near Ravi. 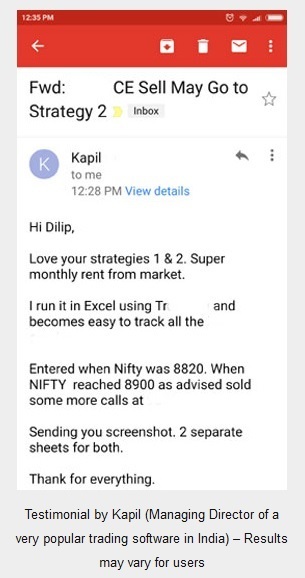 It’s a myth that you can double your money every year in stock markets – this even an excellent trader like Ravi is not able to do. So what makes you believe you can? Frankly there is not hidden formulae. To be successful trader you must have a good logic, proper hedging, patience and discipline. And there is more – in one financial year if you took 12 trades and DID NOT lose money – then welcome to the club of successful traders. Please note I am not talking about profits here – I am only talking about NOT LOSING Money in a total of 12 trades or an entire year with minimum of 12 trades. Then your next target should be 10% – 20% – 30% a year. Anything more than this – you have to do a lot of research and hard work. 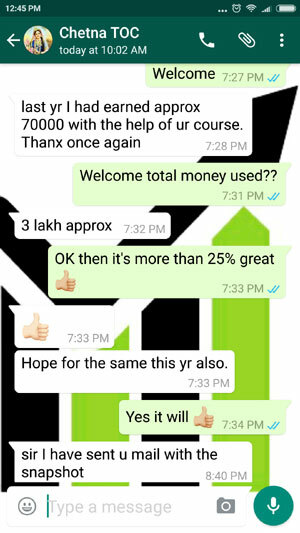 With my courses I can help you reach level one which is more than 25% a year – anything more you have to do your own research which Ravi did and succeeded. If you have decided to be a trader then get all the knowledge possible to set up your trades and start paper trading. Do not put money on the line if you are researching something. Do paper work or home work like you used to do in school. Once you get a good strategy start trading. Wasting time on speculative trading does not only destroy your money but your time also. The more you delay the more profits you are losing. The more time you are losing the more time you are letting go the power of compounding. You see 3% of one lakh is three thousand, but 3% of one crore is 3 lakhs. Can you see the difference? Percentage wise both are same but money wise 3k vs 3 lakhs. If you start with 1 lakh and start seeing success, bring more money to the table to increase your returns. Even if percent remains same, you will make more every month. Side note: If you are making more than 10,000 per month from trading – take out 20% of it to enjoy your success. Watch movies, eat in costly restaurant, go on a vacation etc. You see you should not leave all the money for compounding – just take out a small portion to enjoy your hard work else after some time you will lose interest in trading. Bear market is good for investing and bull market is good for booking profits but only for stock investors not traders. Remember the phrase “Buy when everyone else is selling”, by none other than Warren Buffett. This still stands good for investors but for trades time is short – expiry comes in one month so you cannot and should not take your trades based on bull or bear markets. A bull market or a bear market is not for one month – it runs for months or years. For example the 2007-08 bear market and then 2009-10 bull market. It took three years to complete a bull market and a bear market. So do not take your trades based on bull or bear market – take your trades based on your research. It’s foolish that most traders start with Intraday without any research or plan and lose money almost every-day. They look at everyday return for fun. Everyday return is not important. A months return is important and more important is yearly return. You will certainly not be able to make profits in every trade but you must limit your losses to ensure you are in the game for long. Most traders want to get a return of two-three times in the next six months. They so not have patience to wait. You have started to invest and trade that’s fine but do not think your life will change in a month or six months. It will take about 5-6 years for your life to change. Be patient till that time but do not take the current time easy whether you are losing money or you are making money. Note your trades and study them everyday. You should write why you took a loss and why you took a profit. If you study your trades with time you will become a smart trader. Strategies require a certain amount of money. 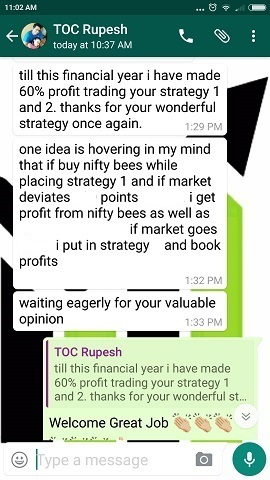 If you find a good strategy that’s fine but its always better to find other strategies that work in different market situations so that you can divide your cash. 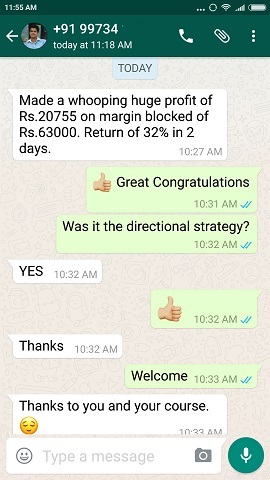 In my Nifty and Bank Nifty course you will get strategies for both volatile and non-volatile market condition. The idea is to make sure your cash is divided into different strategies. This will keep you relaxed. I have said this several times in my blog. Here is one article that explains it well. First get rid of your debts then invest in stock markets. If you trade with loaned money you will be under severe stress and you may not be able to perform at your best. Trade with the money that you can afford to lose to some extend not all. You must make sure that whatever strategy you are trading – it has limited risk. If you are trading positional futures and not hedging it then you are playing with fire. Future trading is leverage on top of that no hedge is financial suicide. You may not survive for long trading naked futures. You can learn future hedging in my course. Factors that affect stock market should be known to you. These factors are market movers. For example as soon as the Nirav Modi case came out, it was clear that PNB stock will fall. 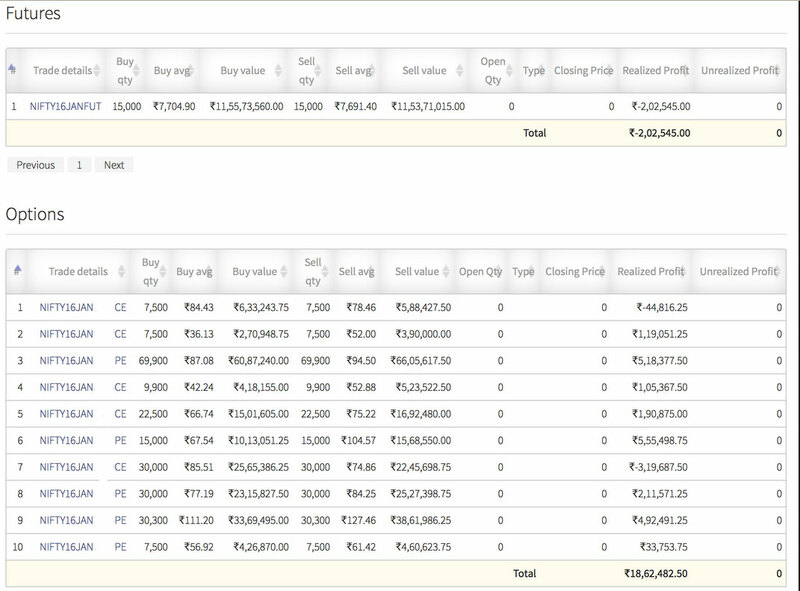 A good trader would have gone short in PNB with proper hedge and of course you know the result. Business news can help you take trading decisions. Keep one hour aside everyday for reading news. Please ignore what experts say – that is not news – I am talking about real business news – what has happened, not what experts are saying. If you repeat a mistake you will see the same result. Once you know your mistake write it down and never repeat it. Please note that occasional losses are fine but mistakes are not. Mistakes are like not taking a stop loss ever after you had defined a stop loss. Not taking profits in hope of higher returns. Trading without hedge etc. Hop you learned top 10 rules of successful derivative trading in this post. Good article really help I can relate to it. Thanks for your post, its useful to learn a discipline.